Bright Lights Windsor is back and families are flocking to see the spectacle of colours and fun. Here’s our short and simple guide to some of the great things to see, do and eat when you visit Bright Lights Windsor 2018. Now head on out there for all the colours and Christmas music and cheer you could imagine! The centrepiece at Bright Lights (and first thing you see) is the giant illuminated tree. It stands 62′ tall and is made even taller with a 5′ star on top. Stay and watch it a while as it is also synchronized to some of your favourite holiday songs. You’ve seen these signs in major cities all over the world. Heck, you’ve probably taken pictures of yourself in front of them. Now it’s our turn. Each letter stands 6 feet tall and the entire sign runs 52 feet long. This ever so sparkly maple leaf measures 20 feet wide by 20 feet high and is a custom built piece. It’s designed and manufactured specifically for Bright Lights, meaning it’s a one of a kind you won’t see anywhere else. 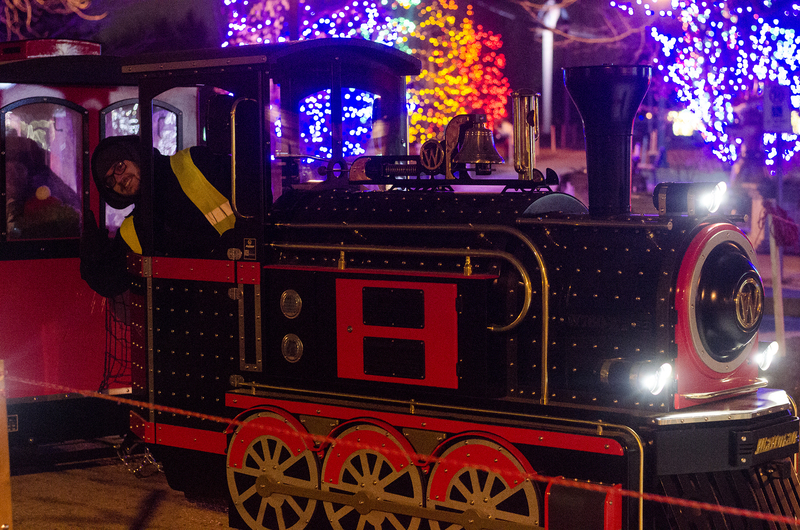 All aboard the holiday train at Bright Lights Windsor! The train runs through the children’s area which is themed in rainbow colours. It runs through the rainbow tunnel, along replica spitfires and down to the entrance of the vendor market. It can fit anywhere for 20 to 32 people per ride depending on the combination of adults and children in each car. If you’re looking to get unique gifts for friends and family, new to Bright Lights this year is a vendor market. Local makers from across the region are rotating in and out of the holiday huts, selling their handcrafted goods. From ornaments to jewellery to clothing, there’s a wide variety to browse and shop through. Did somebody say waffles? Yup! Not just any type of waffles, either. 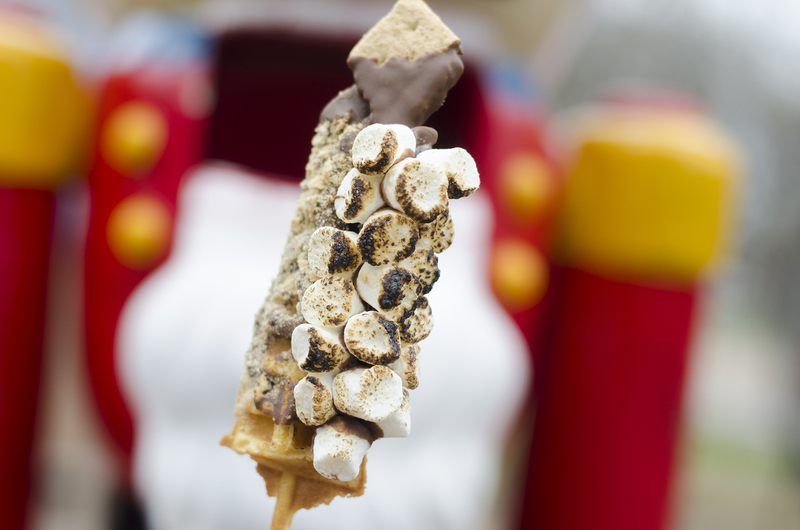 WindsorEats is serving up gourmet waffles on a stick to the crowds every Friday and Saturday in December. You can enjoy the staples like S’mores and our special Unicorn waffle, or try the weekly rotating feature waffle which have been ones made like the giant tree or a cinnamon roll. No matter what you choose, they’re delicious. Go full Canadian. You’re outside at a winter festival, with a sparkly maple leaf as one of the must-sees, likely with a toque on. You might as well have a poutine in your hand, too. 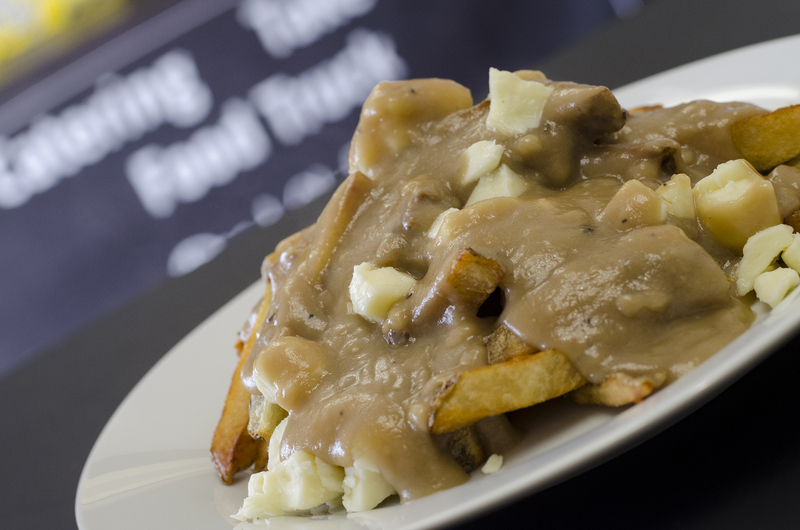 Road Chef is on site serving up classic poutine, as well as their classic arancini and several vegan options.